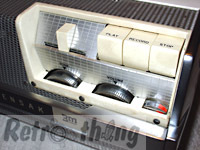 This may not seem small to you, but for a quality reel to reel this is practically a Walkman! I was in high school in the 80's, and we still had this exact same model of player in our language classrooms (it always struck me strange that the textbook was printed in '86, and the book publisher was still offering open reel tapes?). Every part of this hefty recorder exudes quality. The cabinet is cool to the touch because it is made entirely of that mysterious material called steel. The functions are clearly labeled, and everything just plain works. The manual does stretch a point here and there - what they call "feather touch controls" I call "horse-tooth sized ka-chunkers". Maybe that's what it takes to make a product that lasts. All I know is that this deck is 50 years old and it still works and sounds great. Talk about versatile! 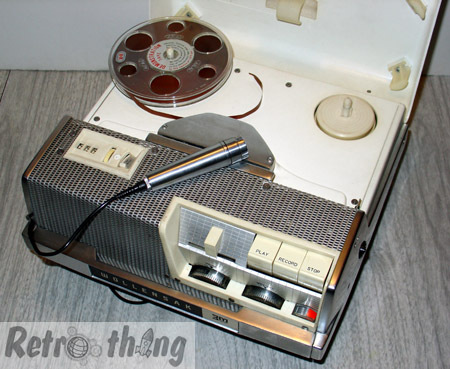 There was a kit available to convert this recorder to stereo. You can also put special foil tabs on the tape which tells the recorder to auto-rewind and replay. One of my favorites add-ons is the cabled remote that attaches to your typewriter to start and stop playback while transcribing notes. If my school had tons of these recorders, I imagine that they were popular - yet there is very little mention of them on the net that I could find. Those that did talk about the deck praised its sound quality, durability, and good looks. My favorite comment was from a musician taking advantage of the Wollensak's lovely tube sound to use it simply as a portable amp. Great idea - and if your set is going really well you can just record your session to tape, and laugh at how much money you saved instead of buying those fakey "analog warmth" digital FX.